The Slo-wear Diesel Engine Flush Kit is more than a dirty motor rinse out. You end up with the fastest, easiest, cheapest way to have your motor run - even if older and worn, to run great - again - to get you back on the road again. This is the chemical help from the Slo-wear Diesel flush Kit you need! This method helps even the dirtiest gas or diesel engines regain their daily usage by - Please Note: Not removing sludge from everywhere - that causes new oil passage way problems. But centers on actual affected part surface problems where friction and binding chemistry is to work - thus restoring function - but not possible by just removing sludge - the common objective of other diesel engine flush kits. Pristine cleanliness, is not our products objective! Yet, whats cleaned is directly helping thousands of people avoid costly rebuilds. Many engines seem worn, WHEN DIRTY, but are well within serviceable amounts of wear, YET run as if they’re worn out! That’s because a perfectly good engine will produce poor performance, when harmful deposits and friction drag rob it of its true horsepower producing capability. Does that seem reasonable to you? By simple use of our Combo Flushing Kit - shown here; in 2 steps, you remove the grime and sludge causing your engine parts to lower horsepower lowering negatives. Our method reverses this negative restoring the clean smooth internal part surfaces and sub systems, That's whats needed for movement needing it. 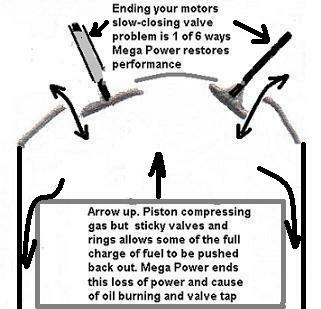 Step One: Add items marked 1, 2, and 3 to the fuel, engine, and oil. use vehicle as you would normally for a week. Step Two: Change oil as directed adding Items 4 and #5 to the new oil. That's the treatment and fix. Repeat at future oil changes to extend engine life if you want to. Thats our Diesel Engine Flush Kit features. And, included, MC+ fills worn surface areas for a return chemically to a former like-near-new run function on worn parts. Plus Bonus Combustion Cleaner FREE while supplies last. Diesel Engine Flush Kit Helps Chemically. Does it work like a $5000 + motor overhaul ? No! It will run like near new again. Does it end cylinder sleeve leakage? No? This isolates that problem. Does it end blower seal leakage causing blowby? No? This isolates that problem. It prevents them from showing up years sooners, customers tell us. Does it perfectly clean your motor of sludge? No! Leave sleeping dogs alone! It does end the sludge caused problem? Yes! That's what your diesel needs - and every engine and transmission... order now! With delivery by Fedex in a few days with easy-to-follow directions - and free phone help if needed - IN A FEW DAYS have your engine RUNNING UP TO SPEED AGAIN. Order the Slo-wear Diesel Engine Flush Kit Treatment below! Slo-wear Diesel Flushing Oil Concentrate has helped our customers avoid or put off for years on engine rebuilds, that can run $4000 upward. Is it worth the try - I'm a believer so I say yes! Just as antihistamines stop runny noises that cause fluid to fill your lungs - the way to return your normal function chemically, The Slo-wear Flush Cleaning Method combines a proven method that cleans and revitalizes diesel and gas engines quickly and economically. Order here... This results in significant performance improvements! Diesel Engine Flush Kit Oil Concentrate is THE real-life FIX for sludgy engines, and perking up performance in mid life & older engines. It restores FULL cleanliness to all lubricated parts of engines, transmissions & hydraulics. Flushing Oil Concentrate is the PERFECT, real life fix for perking up performance in mid-life and older engines. It leaves all lubricated parts of engines, transmissions and hydraulics in spotless condition. Removes sludge & hard carbon. Slo-wear Diesel Engine Flush Kit Flushing Oil Concentrate has helped our customers avoid or put off for years on engine rebuilds, that can run $4000 upward. Is it worth the try - I'm a believer so I say yes! Order yours today! 6 items total includes directions and free phone help if needed shipped to your do0r in about 3 days. $400+$50 s&h=$450 total.